Electric-drive vehicles, whether powered by batteries, fuel cells, or gasoline hybrids, have within them the energy source and power electronics capable of producing the 60 Hz AC electricity that powers our homes and offices. When connections are added to allow this electricity to flow from cars to power lines, we call it “vehicle to grid” power, or V2G. Cars pack a lot of power. One properly designed electric-drive vehicle can put out over 10kW, the average draw of 10 houses. The key to realizing economic value from V2G are grid-integrated vehicle controls to dispatch according to power system needs. The conventional view expects battery vehicles to be plugged in to charge their batteries. 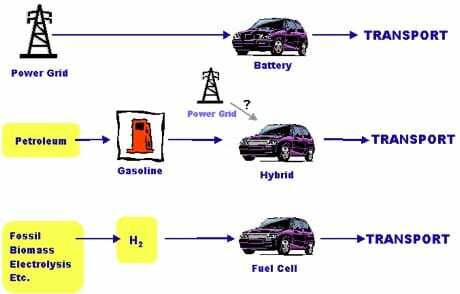 Hybrid and fuel cell vehilces generate electricity from the fuel in their tanks. Plug-in hybrids can either run from fuel or can charge from the grid. In the conventional view, electricity never flows from vehicle to the grid. 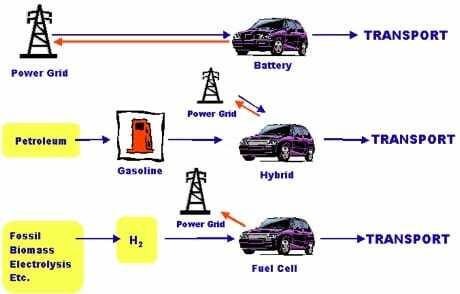 The V2G concept is that battery, hybrid, and fuel cell vehicles all can send power to the electric grid, power that all three already generate internally. For battery and plug-in hybrid vehicles, the power connection is already there. For fuel cell and fuel-only hybrids, an electrical connection must be added. Red arrows indicate electric flow from vehicles to the grid. To conduct scientific research, educate the next generation of students, and actively engage industry, policy makers and the public, and facilitate use of power sources such as surface wind, geostrophic winds, and ocean currents.